This dedicated battlefield surveillance and forward air control aircraft was developed in the late 1960s as a joint venture by Aerfer (later Aeritalia) and Aermacchi. Developed with a new, narrower, low drag fuselage and the wings of the Lockheed AL.60, for which Aermacchi held a produc-tion licence, the AM.3 featured a new fin. Two prototypes were built (I-AEAN and I-RAIC), designated MB-335As and the first (assembled by Aermacchi) flew on 12 May 1967, the Aerfer assembled second prototype flying on 12 August 1968. Evaluated by the Italian army, but no orders were received. An improved AM.3 was developed. 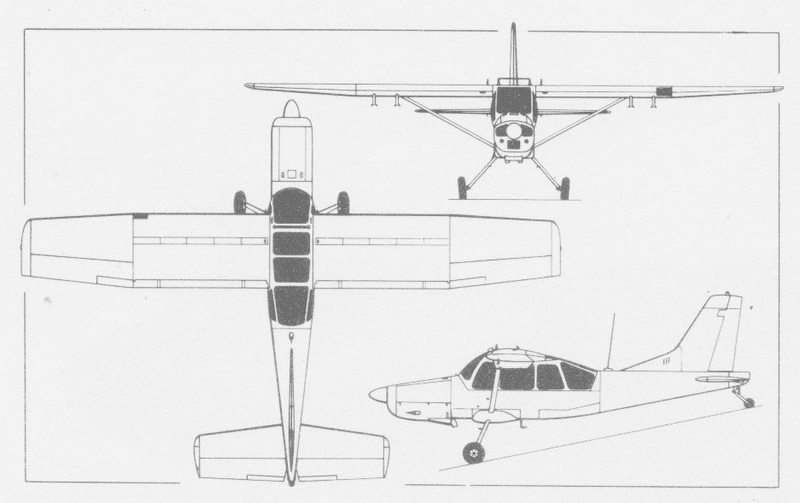 The prototype (I-TAAA) powered by a Continental GTSIO-520-C of 340 hp but later fitted with a 340 hp Piaggio-built Lycoming GSO-480-Bl B6 piston engine and seating two in tandem. This production standard was designated AM.3C and first flew in May 1967. One of the AM.3 prototypes was briefly evaluated by the USAF, Army and USM, as part of their Pave-COIN requirement .The AM.3C featured lengthened outer wing panels (by 3 ft 2.5 in / 0.98m) raising the wing area by 14.21 sq.ft / 1.32 sq.m. The AM-3 wing is NACA 23016 at the root and NACA 4412 at the tip. The nose was lengthened and refined aerodynamically, fairing incorporated under the fuselage for attachment points for the wing struts and main undercarriage legs. The plexiglass windows were bulged for increased visibility. A third seat in the rear was removable to accommodate a stretcher or freight. Provision of a single NATO M-4A stores attachment rack under each wing assisted contracts being obtained from the South African Air Force for a total of 40 AM.3Cs, which were given the name Bosbok, and three for Rawanda. The South African aircraft were delivered between May 1972 and December 1974. Defence cuts forced their retirement by September 1992. Two were preserved and the remainder sold to civilian operators. Wing span: 41 ft 8 in (12.7m).